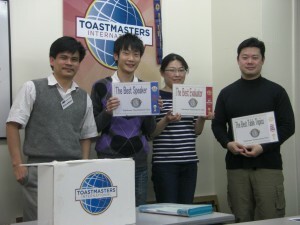 Yokohama Toastmasters club first regular meeting in 2013 was held at Hatoba Kaikan on Jan. 19th. 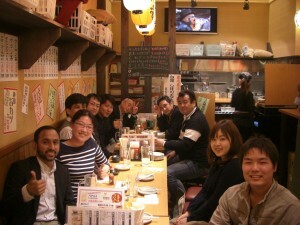 Some members went home or made a journey at the end of the year and New Year. So there were a lot of souvenirs!! Today, TM R.R took first TMOD. At first he was a little bit nervous. But he managed the moderator of the meeting successfully. In addition, today two new members joined YTMC. They are TM M.K and TM N.S. WELCOME!!! Let’s learn communication skill and leadership skill together! YTMC made a very good start in 2013.